The Python community takes security very seriously. In an effort to enhance security and promote transparency about security matters, the Python Security Response Team (PSRT) has created a security-announce mailing list. This mailing list will allow the PSRT to communicate about security-related matters to anyone in the Python community who signs up. Join this list to stay on top of the most recent security fixes to the Python language. Click here to learn more about the mailing list and to sign up! 2017 is drawing to a close and we are super-excited to start the official Python Developers Survey 2017! We’ve created this survey specially for Python developers who use it as their primary or supplementary language. We expect the survey findings to help us map an accurate landscape of the Python developer community and to provide insight into the current major trends in the Python community. Please take a few minutes to complete the Python Developers Survey 2017! Your valuable opinion and feedback will help us better understand how different Python developers use Python and related frameworks, tools and technologies. We also hope you'll have fun going through the questions. The survey is organized in partnership between the Python Software Foundation and JetBrains. After the survey is over, we will publish the aggregated results and randomly choose 100 winners (from those who complete the survey in its entirety), who will each receive an amazing Python Surprise Gift Pack. RESOLVED, that the Python Software Foundation Q2 2017 Community Service Award to Lynn Root for her work as the founder of the San Francisco Chapter of PyLadies, a member of the Django Software Foundation, and as a tireless volunteer at PyCon. If you can name one person associated with PyLadies, it is Lynn Root. Lynn’s relentless support, organizing, and evangelizing on behalf of PyLadies is known by many. “Lynn’s enthusiasm and passion for bringing more women into tech are well complemented by her organizational skills, which were especially needed at pivotal moment in early PyLadies history. Lynn helped grow PyLadies into, what is now, a global organization that’s had a huge impact on the Python community,” PyLady Esther Nam, one of the founders of the PyLadies Los Angeles chapter, explains. In late 2011, Lynn began learning to program, as some of graduate programs she was considering required her to have some programming expertise. “I reached out to San Francisco’s Women Who Code to organize a Python study group,” Lynn recalls, trying to find like-minded women to join. 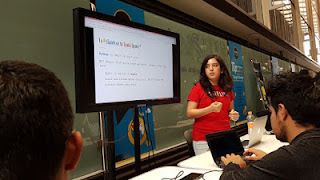 She had used Python in a weekend hackathon and found it to be a beginner friendly language. The following year, in 2012, PyCon was held in Santa Clara. “Lynn reached out and organized a carpool of Bay Area Pythonistas to attend the conference”, Esther remembers. PyLadies from the first chapter in Los Angeles attended, where Lynn met with them to learn more about PyLadies. The next month, she founded the San Francisco chapter. Lynn continued to act as a principal organizer for PyLadies San Francisco for the next four years. Overlapping with her time as PyLadies San Francisco lead organizer, Lynn championed other significant projects including the creation of `pip install pyladies`, the PyLadies open source kit for new organizers. 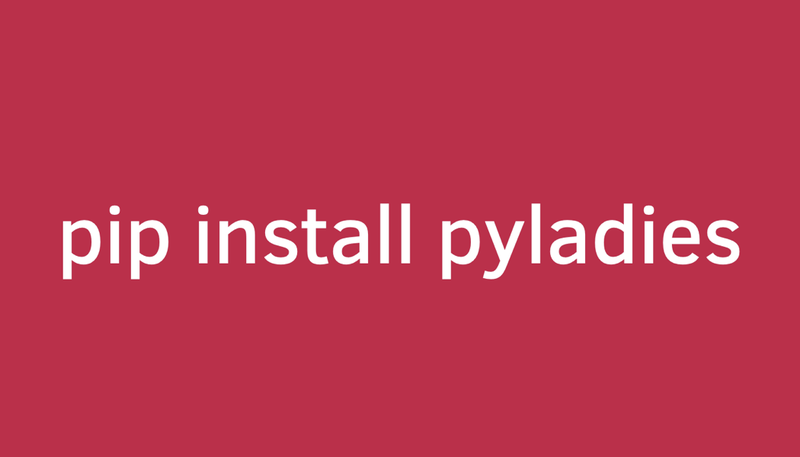 The development of open source tools for PyLadies has been instrumental in getting the word out about PyLadies. Lynn was able to use these tools to help start international PyLadies communities in Stockholm, Zagreb, and Brno. Lynn also took an active role in bringing PyLadies content to PyCon. 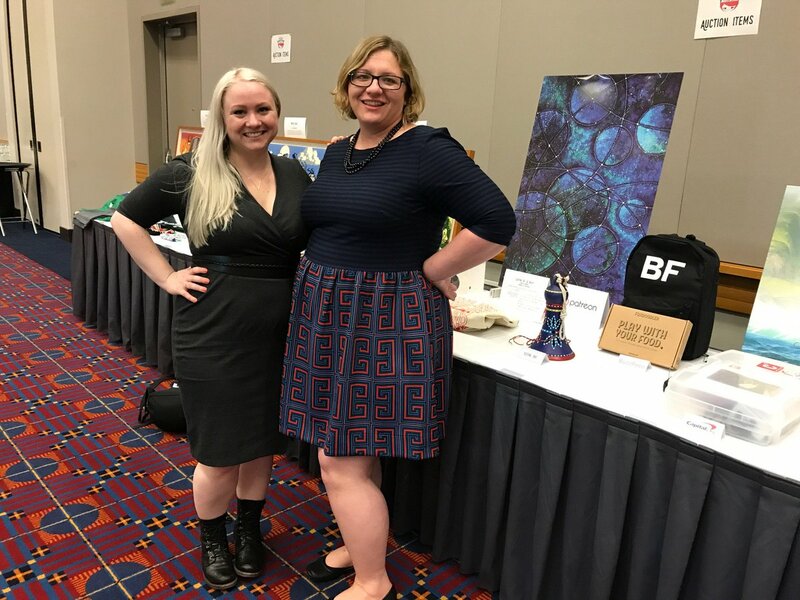 During Lynn’s first term on the Python Software Foundation Board of Directors in 2013 to 2014, Lynn helped plan and run the first PyLadies Charity Auction at PyCon. Months of work go into organizing the charity auction; it requires donations to be procured beforehand, besides auctioneering on-site. 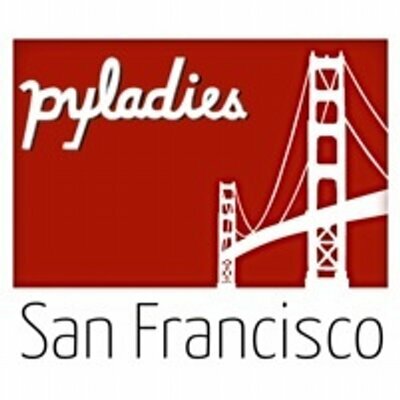 The inaugural PyLadies Charity Auction raised $10,000.00 USD for PyLadies. Commenting in a 2013 press release about the auction, Atlanta PyLadies founder Laura Cassell explains, “we're all so resourceful already that I suspect this money is going to go a long way towards helping women who want to get into the industry. I'm still a little misty-eyed at the whole thing, to be honest." Besides her PyLadies work, Lynn has been a speaker at PyCon four times, PyCon Lightning Talk Chair since 2014, frequent session runner, and recurring PyCon volunteer. PyLadies Benevolent Dictator for Life? I asked Lynn if she has ever been called the PyLadies Benevolent Dictator for Life (BDFL). Lynn shook her head, she does not see herself in that fashion. But it is hard to refute the strong footprint she has left on the PyLadies community. Lynn has written several Python open source tutorials, like the web scraping with scrapy and postgres, that are often used in PyLadies workshops and are highly visited (over 65,000 times to date this year! ), and has spoken at PyCons around the world: EuroPython, PyCon Finland, and PyCon Brasil. Lynn was the original PyLady I consulted with when starting the PyLadies Chicago chapter in 2014. From founding her local PyLadies chapter, to volunteering at PyCon, to catalyzing other initiatives like the Django Software Foundation, Lynn has been an unwavering advocate for women in the Python community and for the broader Python community itself. The thing that Lynn says has been most satisfying for her as a Python community organizer and advocate has been the rise of women in Python. “In 2012 only 8% of speakers at PyCon were women now in 2017 we have approximately 33%”. With the rise of PyLadies at PyCon and throughout the world, it’ll be exciting to see what comes next for the PyLadies community and for those that have helped make PyLadies such a tremendous success. The PSF is excited to announce its first ever membership drive beginning on September 18th! Our goal for this inaugural drive is to raise $4,000.00 USD in donations and sign up 3,000 new members in 30 days. If you’ve never donated to the PSF, you've let your membership lapse, or you've thought about becoming a Supporting Member - here is your chance to make a difference. You can donate as an individual or join the PSF as a Supporting Member. Supporting members pay $99.00 USD per year to help sustain the Foundation and support the Python community. Supporting members are also eligible to vote for candidates for the PSF Board of Directors, changes in the PSF bylaws, and other matters related to the infrastructure of the foundation. To become a supporting member or to make a donation, click on the widget here and follow the instructions at the bottom of the page. We understand that not everyone has the time to volunteer, but perhaps you’re in a position to help financially. We’re asking those who are able, to donate money to support sprints, meet ups, and community events. Donations support Python documentation, fiscal sponsorships, software development, and community projects. They help fund the critical tools programmers use every day. If you're not in a position to contribute financially, that's ok. Basic membership is free and we welcome anyone who would like to join at this level. Register here to create your member account, log back in, then complete the form to become a basic member. What does the PSF do? We fund great projects. So far this year we have approved over $200,000.00 USD in grants to over 140 events worldwide. We’re on track to surpass last year’s total of $265,000.00 USD in grants to 137 events in 45 different countries. We organize and host PyCon US. This year’s event brought together 3,389 attendees from 41 countries, a new record for PyCon! Our sponsors’ support enabled us to award $89,000.00 USD in financial aid to 194 attendees. We celebrate awesome Python contributors. Community Service Awards are given out quarterly, honoring individuals who support our mission. We implemented a trial Python Ambassador program that we hope to expand in the next year. This program provides funding for a dedicated Pythonista to travel locally to perform Python outreach. We provide fiscal sponsorship support for Python projects, where the PSF collects targeted donations and reimburses expenses on that projects' behalf. We support Python programmers worldwide by funding sprints and workshops that enable people to work on Python-related projects that advance the mission of the PSF. We at the PSF want to thank you for all that you do. Your support is what makes the PSF possible. February 2017 marked the beginning of a new journey for a new regional Python Conference - PyCon Pune. PyCon is the meeting place for community. It gives Pythonistas an opportunity to come out of the virtual world and meet the real people behind the nicknames and the handles. It gives them an opportunity to learn new things and share their knowledge with others. Considering the vast geographical territory of India, a single PyCon event wasn’t sufficient. 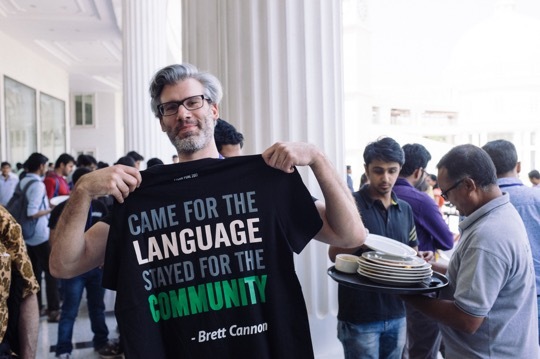 PyCon Pune offered the Python community another chance to interact. It was a four-day event; the main conference on the first two days and development sprints the second two. It was a single-track event, so all 550 attendees could attend all the sessions. Pune, also known as the Oxford of the East, is amongst the fastest growing cities in the Asia Pacific region. Pune witnessed this PyCon at a hotel called Amonora, the Fern. The venue was beautiful, and we were grateful to have it: just a few weeks before the conference began, we were afraid we would have no venue at all! The event had been located at one of oldest engineering colleges in Pune, but the venue canceled two weeks prior to the conference. Not quite the kind of news any organizers would like to hear, last minute (I can vouch for that, I was one of them). Python Software Foundation then extended its hand to help. Team PyCon Pune as well as the Python community in India cannot thank the PSF enough for this. The PSF has always been a huge supporter of PyLadies. This time, they offered to share their booth with us. PyLadies had a huge presence at the event. 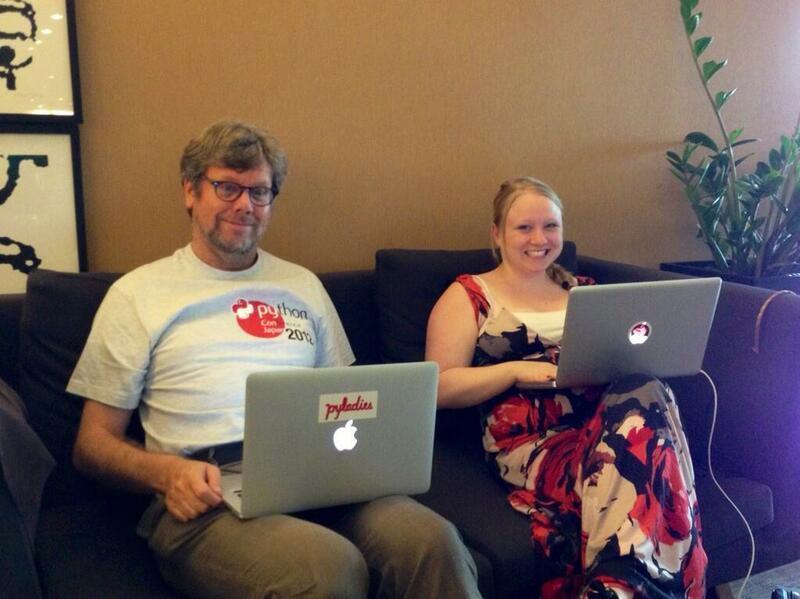 From volunteering, to management, PyLadies were there everywhere. Yes, “Python is for girls.” And if we PyLadies need support in the face of a crisis, the PSF is there to hold us. The first ever thing that we decided for the conference was the quote to be used on the conference t-shirt. This set the tone of the conference. The conference is a completely volunteer-driven event: the website, finance, AV and the overall management were run by volunteers, celebrating the community in the truest sense. Help poured in from pythonistas worldwide. The logo was designed by Ryan Larch from Australia. 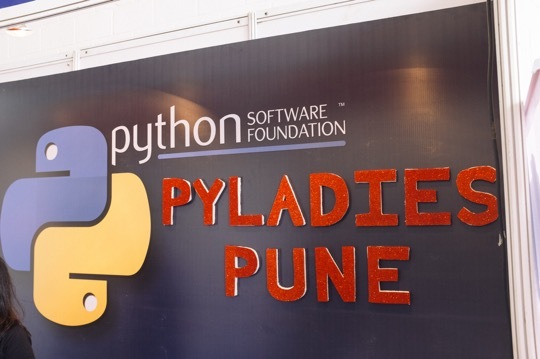 Python communities from all over India along with Python Pune and PyLadies worked tirelessly together to make the event a success. These people keep the soul of Python (the community and language) alive. With a welcome note by Kushal Das, the chair commenced the conference. The first keynote was by Honza Král. He talked about his journey in the open source world. It was interesting to know about his hurdles and how he overcame them. It is also always inspiring to see at masters were students once too. Next, Anand Chitipothu taught us to write beautiful code.The post-lunch session began with the keynote by the “official Perl guy” of the Python community, John “Warthog” Hawley, who described the path from software to hardware hacking. The day ended with an enchanting experience - a keynote by Pravin Patil, a teacher who uses Python to teach Physics. Python plus Physics plus a Laser equaled magic in his presentation. Katie Cunningham began Day 2, followed by the Economics Professor Stephen Turnbull. He has helped to develop Ghostscript, XEmacs, Python, and GNU Mailman. He offered a word of encouragement to us saying, “You can help develop Python - and you should!” After lunch, Nick Coghlan delivered his keynote. He discussed “opportunities and challenges in open collaboration.” The last keynote talk was by Terri Oda, about security in the open source world. This led to the end of the main conference. The mentors for the dev sprints spoke on what they were going to work on. An open feedback session marked the close of the main conference. 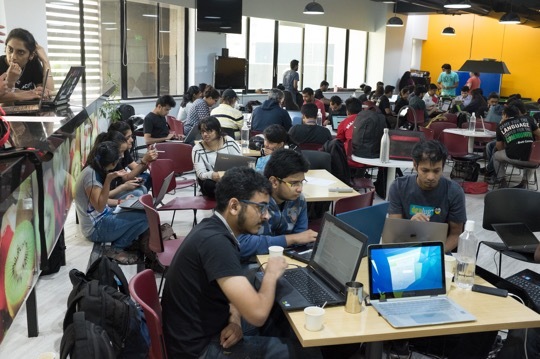 For sprints, the conference moved to the Red Hat office in Pune. A dozen projects added features and fixed bugs during the final two days of the conference. The sprints had proven to be the most popular portion of the conference: Tickets had sold out within a week. The Red Hat office looked like a hackerspace over the weekend. People were coding, learning, having fun and celebrating Python. It was the first ever dev sprint experience for more than 95% of the attendees. It took most of the people to some time to understand what is going on and how they could participate. Slowly folks started flocking around different mentors. There were good number of people gathering around Nick—many Pythonistas have a dream to become CPython core developers. More than 10 patches were submitted to the language. Web.py, ElasticSearch, Django, es-django-example, OpenCabs, Pagure and micropython held sprints as well. The actual number of patches submitted can be found here. I took shelter in the micropython and hardware room, where we were worked on fun bunny boards with esp8266 devices. John was there guiding us, changing our lives (my life for certain) with blinking LEDs. The best surprise came at the end. He gave each of us a bunny board. What a lovely souvenir to take home! The conference is intended to give people the feeling of community. The event is over but the spirit is hasn’t diminished. Please join us next year for PyCon Pune 2018, February 8 - 11. It has been three years since I first learned about PyCon. I watched some workshops and talks and I was amazed by how inviting, open and inclusive the community was. In fact, that was one of the key aspects that inspired me to learn Python, use it, help build the Python community here in Mexico. 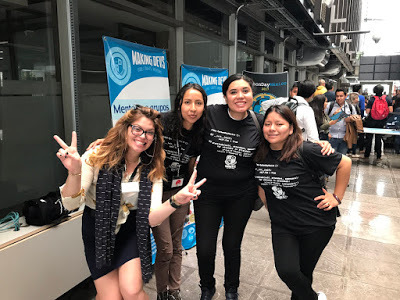 Fast forward to the beginning of this year: I was contacted by the organizer of LinuxChix in Mexico, who is also member of PyLadies, with the idea of organizing a PythonDay in Mexico. This first PythonDay, she suggested, had the purpose of bringing a PyCon to Mexico. We eventually found another woman who shared the same ideal and we set about working to bring the Mexican Python community to an event that, hopefully, inspired them to be better Pythonistas the same way the first PyCon i witnessed did to me. We first wondered how big of a community we had in Mexico. Despite being involved with Python for three years I barely knew the people or meet ups, apart from PyLadies, in Mexico devoted to the language. We figured that with Mexico being a country of 130 million there was large chance there would be a sizable population interested in Python. Along the way we discovered that the Python community in Mexico is not only vast, but also scattered across the nation. These reasons only encouraged us more to organize a PythonDay, it would be a great starting point to bring together the community. We selected June 10, 2017 as the day for the first PythonDay Mexico. People from all over the country came to meet their fellow Pythonistas and listen to the amazing talks we selected for this year. Initially we expected about 160 people, but we could not have been farther off! Over 400 people registered for the event and in its peak, approximately 300 Pythonistas were in attendance. We were glad to learn that 30% of the attendees in the event were women, which is not a high number, but in comparison to the roughly 15% of women in technology it gives hope to learn that many women are interested in programming. Attendees traveled up to 1270 miles to attend PythonDay Mexico. 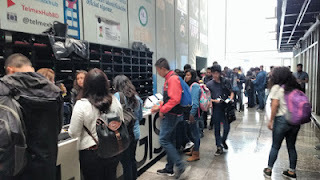 In terms of geography there were attendees from Sinaloa, Jalisco, Hidalgo, Nuevo Leon, Puebla, Mexico City and Yucatan and every one of them was excited to hear the talks and workshops as well as to meet other Python lovers. During the event we did not have any incident or complaint; everybody followed and honored the Code of Conduct lending to a greatly collaborative. Honestly we could not have asked for a better audience. But then again, Python communities all over the world are like this, awesome. PythonDay Mexico had an amazingly diverse set of speakers. We had people from Paraguay, India, USA, Italy, Germany and Mexico. Even if our speakers could not be physically present, they made efforts to actually engage and interact with the audience in their remote presentations. Many of our remote speakers are a part of the Python Software Foundation Board of Directors like Naomi Ceder, Trey Hunner. Board member Lorena Mesa gave her talk in person. Topics covered by the talks and workshops included data science, machine learning (e.g. deep learning), CPython, Python core development, Python in web development, Python extensions in other languages (Rust, Go), Testing, building bots with Python and getting Python ready for production. The range of topics permitted a bit of something for everyone. We at PythonDay want to thank everyone that helped make this possible. The organizers spent many months talking, planning, getting funds and convincing people that Mexico is a great place for Python. The PSF was a major player in the making of this event, given that not only were they one of our major sponsors but were also a wonderful source of speakers, advice and even promotion of the event. Of course the speakers and volunteers were also a huge part of the success of this event. Finally, the event would not have been possible without the attendees, without them the event would only have been a bunch of speakers and swag. 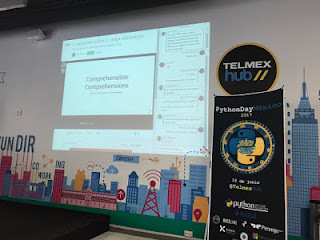 Our mission after PythonDay Mexico is to bring a PyCon to Mexico and to keep connecting all the people interested in Python within Mexico with programming and events. For PyConMx we are actively seeking volunteers and organizers, if you'd like to help us or learn more you can contact us at pythonday.mx@gmail.com or mx@pyladies.com, we really hope to hear from you!